Incorporating deep and risky themes into an animated kids film is difficult, especially when these themes have political undertones. An example of this done to perfection is Pixar's Wall-E, a film that heavily focused on environmentalism and consumerism but worked it seamlessly into the plot, creating a kid-friendly animation that simultaneously got the brain pumping. On the opposite end of the spectrum, we have Disney's Frozen. Frozen is a fun film with spellbinding animation and a handful of decent gags, but its gender politics don't work. It forces in a half-baked feminist life lesson in its final act that ultimately resonants with very little that came before it, and comes to a sloppy conclusion that fails to invite any deeper analysis. Zootropolis doesn't only tackle feminism (and in a far better way), but it also discusses racism, immigration, prejudice and self-acceptance. 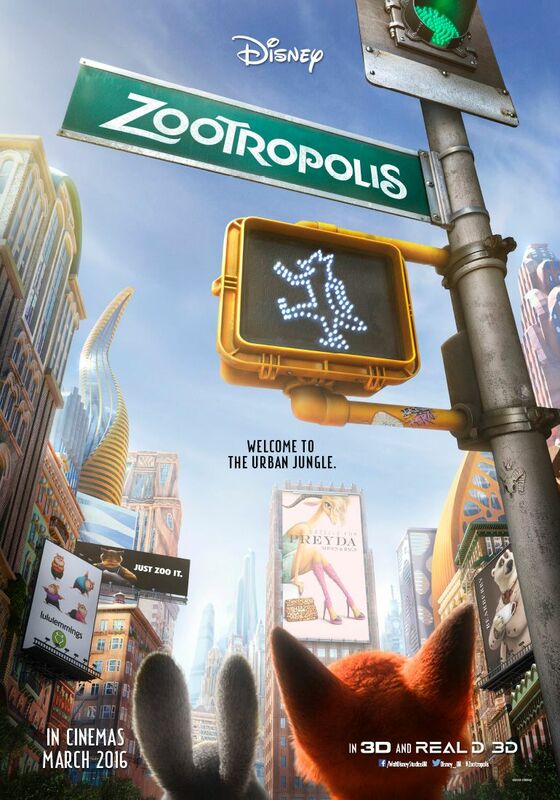 There's a lorry-load of thematic ideas here, more than enough for one film in fact, but the sheer ingeniousness of Zootropolis' script is that it works each and every theme into the plot cleanly and effectively, and still finds time for an interesting story, well developed characters and consistent humour. It's a fantastic achievement. Judy Hopps (Ginnifer Goodwin) is a rabbit that has spent her life desiring to be a Police Officer, despite the fact that this world (populated by anthropomorphic animals that do as much as visit banks and drive cars) has never seen a bunny cop. She succeeds, though, but is refined to parking duties for her first day. Soon she finds herself in the middle of a case focused on disappearing animals, and so she brings along a fox named Nick (Jason Bateman) to help her solve the case in the two days that her boss grants her. It's a simple plot, but an effective one. It allows plenty of room for character growth and focused themes, but it's also packed with twists and turns. You find yourself realising about half way through the film that you can't predict where the story is headed, and it's thrilling. The film kicks off at a lighting pace from the first sequence (Judy is a fully trained cop within the first five minutes) and scarcely stops moving until the credits roll. It's superbly written in terms of narrative and pacing. Another great benefit of Zootropolis is its sheer likability. In fact, while viewing the film I was thinking about what I would write for this review, and the word "likeable" appeared in my mind more than any other. Judy is a great protagonist for the film, boosted further by Goodwin's excellent vocal performance. She is fun and bouncy and optimistic, but never unrealistically so. She goes into her first day with glittering eyes, but is forced to put on a devastatingly brave face when her parents video call her that night after a disappointing first day. As a viewer, you just want the best for her. Jason Bateman fares equally as well in his portrayal of Nick. Nick starts the film as a sleazy, manipulative character but his journey begins immediately, and he's an entirely different entity by the film's climax. The whole thing feels organic and perfectly executed, and Bateman is given many of the film's funniest one-liners. In fact, the voice acting on the whole here is extremely impressive, and possibly one of the strongest ensembles I've seen for an animated film. There's not a weak link amongst them, and it allows even the small supporting characters to feel more fleshed out and welcoming. When the film came to an end, I wasn't ready to leave the city of Zootropolis. By a long mile, though, Zootropolis' crowning achievement is its focus on deep and thought-provoking themes. Judy is repeatedly told in the earlier scenes that she won't ever be a cop since she's a rabbit, but we see how this just makes her more determined. Yet the film doesn't just focus on this side of prejudice: in a heartbreaking flashback sequence, Nick talks about how he was bullied as a child and just gave into the prejudice since he knew he was always destined to be stereotyped as a sleazy fox. The film doesn't shy away from the dark sides of prejudice, and it's refreshing to see. Zootropolis also tackles feminism, but in a subtle manner. When people laugh at Judy for wanting to be a police officer, it rings of undertones of women not allowed jobs due to their gender. The film never specifically refers to Judy's gender as an issue, but it's difficult not to read into the metaphor this way. The film's plot also takes on a predator vs prey framework, which invites countless metaphors alluding to racism and immigration. At one point an animal shouts at another and angrily tells them to "Go back to the forest, predator", to which he replies "I'm from the Savannah". It sounds tacky, but within the world the film sets up it feels real, and it hits hard. You only have to change three words from that interaction and you're presented with something very real and very topical. For little kids to take in this message - which the film sugar coats in no way whatsoever - at a young age is just fantastic. If Zootropolis has an issue it's that the film's humour never really comes into its own. That's not to say that the film isn't funny - a sloth based sequence inside a DMV is particularly hilarious, Nick has a handful of great one-liners, there's a tonne of smartly integrated pop culture references, and the very final sequence before the film cuts to its credits is just brilliant - but with a film so refreshingly original in every other respect, it's difficult not to feel a tad underwhelmed by the conventionality of the humour. The film will have you chuckling along the whole way through, but the laugh-out-loud moments are rare and, when they do come, kind of obvious. Yet, it doesn't have too big an impact on the film thanks to how strong Zootropolis is in every other way. The intricate and speedy plot keeps everything moving nicely, the likeable and fleshed out characters never grow tiring or annoying, and the social/political commentary keeps the mind functioning throughout. The film never dumbs down its ideologies and never acts like it's just a visual treat for the little ones: it tells people to always try to be who they want to be, but also to always accept others for who they want to be. It's packed with heart and it has a functioning brain. Zootropolis is a fantastic kiddie flick, but it's an even better film. To Summarise: Fast, well performed and deliriously lovable, Zootropolis is a perfectly balanced Disney animation that excels with its intricate plot, fleshed out characters and a heavy reliance on thought-provoking, intellectual thematic constructs.